We're as amazed at Koons Lincoln Silver Spring as you are at the advances that car makers have made with automotive technology. 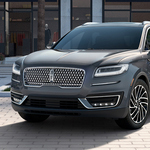 The 2019 edition of the Lincoln Nautilus is no exception as Lincoln continues to add safety and convenience to their lineup of vehicles. The Lincoln Co-Pilot 360 package is a bundle of advanced features that enhances the safety of driving on today's streets. It includes Automatic High Beams, Lane-Keeping System, Auto Emergency Braking, Rear Backup Camera, and the Blind Spot Information System with cross-traffic alert. Another option that's available is Lincoln's Adaptive Cruise Control system. It adds intelligence to traditional cruise control by tracking the speed of traffic ahead of you and helping you keep the Nautilus in its lane. These technologies work together to allow you to drive more efficiently in stop-and-go traffic on today's busy city streets and freeways.